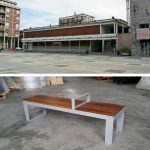 Created for public spaces, the PAK bench design was inspired by the “Casa del Fascio” in Lissone, Italy. The building (picture below) was designed in 1938 by the master of Rationalist architecture, Giuseppe Terragni. PAK bench is a masterpiece of sustainability. 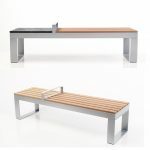 Structure made of solid aluminum, seat made of composite wood slats or man-made stone. 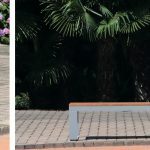 Antonio Larosa designed the PAK bench to be completely recyclable! …but seriously, who wants to convert into reusable material such a beauty? Buy PAK and keep it forever!